Recent decades have witnessed the fragmentation of Reformation studies, with high-level research confined within specific geographical, confessional or chronological boundaries. By bringing together scholars working on a wide variety of topics, this volume counteracts this centrifugal trend and provides a broad perspective on the impact of the European reformation. The essays present new research from historians of politics, of the church and of belief. 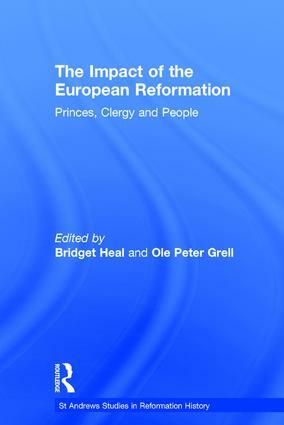 Their geographical scope ranges from Scotland and England via France and Germany to Transylvania and their chronological span from the 1520s to the 1690s Considering the impact of the Reformation on political culture and examining the relationship between rulers and ruled; the book also examines the church and its personnel, another sphere of life that was entirely transformed by the Reformation. Important aspects of knowledge and belief are discussed in terms of scientific knowledge and technological progress, juxtaposed with analyses of elite and popular belief, which demonstrates the limitations of Weber's notion of the disenchantment of the world. Together they indicate the diverse directions in which Reformation scholarship is now moving, while reminding us of the need to understand particular developments within a broader European context; demonstrating that movements for religious reform left no sphere of European life untouched. Contents: Introduction, Bridget Heal; Part I Princes: Hubmaier, Schappeler, and Hergot on social revolution, Tom Scott; The politics of law and gospel: the Protestant prince and the Holy Roman Empire, C. Scott Dixon; Rich and poor in Reformation Augsburg: the city council, the Fugger bank and the formation of a bi-confessional society, Bernd Roeck; The contest for control of urban centres in Southwest France during the early years of the Wars of Religion, Kevin Gould. Part II Clergy: The 'new clergies' in Europe: Protestant pastors and Catholic Reform clergy after the Reformation, Luise Schorn-SchÃ¼tte; The clergy and parish discipline in England, 1570-1640, Christopher Haigh; The Virgin Mary and the publican: Lutheranism and social order in Transylvania, Christine Peters; Kirk in danger: Presbyterian political divinity in 2 eras, Michael F. Graham. Part III People: Fairies, Egyptians and elders: multiple cosmologies in Post-Reformation Scotland, Margo Todd; Sacred spas? Healing springs and religion in Post-Reformation Britain, Alexandra Walsham; The reformation of astronomy, Adam Mosley; French books at the Frankfurt fair, Andrew Pettegree; Index. Dr Bridget Heal is a Lecturer at the University of St Andrews, UK and Professor Ole Grell is Professor in Early Modern History at the Open University, UK.